An interesting book on Los Angeles’ water history. Water is the lifeblood of any city and Los Angeles is certainly no exception. The history of water in the City is multifaceted, complex and well-studied. Water not only helped Los Angeles to grow by annexations and consolidations but it has affected the physical landscape in the form of aqueducts, pumping stations, power infrastructure, channelized rivers and much more, not just in Los Angeles, but across the southwestern United States. Only 12% of the City’s current water supply is local (i.e. from local groundwater or recycled water). The rest comes from three principal sources: the Colorado River, the Sacramento-San Joaquin Delta and the Eastern Sierra via the Los Angeles Aqueduct. 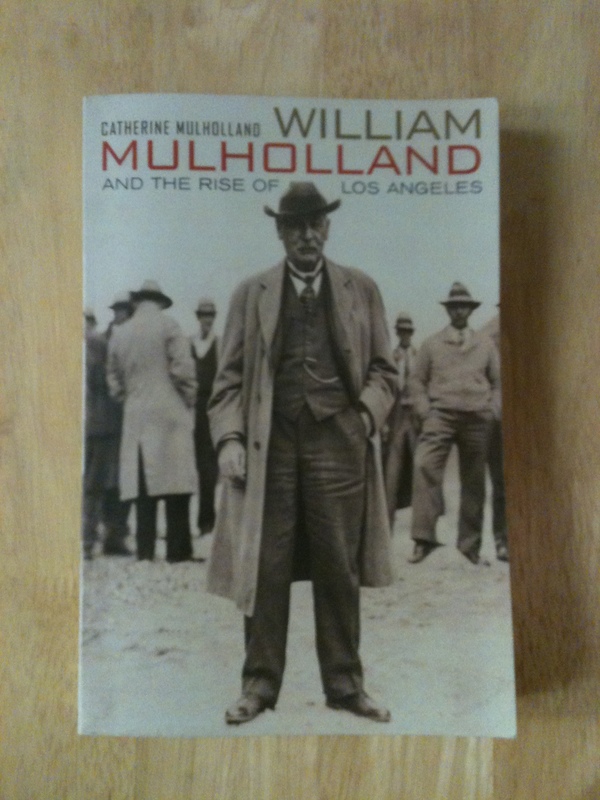 I’m currently reading William Mulholland and the Rise of Los Angeles, a biography by the subject’s granddaughter, Catherine Mulholland. William Mulholland (1855-1935), immigrated from Ireland as a young man and found his way to Los Angeles. He started his water career as a well digger and rose to the top of the City’s then privately owned water company, teaching himself engineering on the job. By 1902 voters had approved the sale of bonds to buy out the company and establish municipal ownership of the City’s water supply with Mulholland as the first superintendent of what is now known as the Department of Water and Power. In an era when the entire supply was local and dirt streets had to be sprinkled with water to keep the dust down, this was a momentous event. Mulholland was always trying to keep ahead of growing population and water demand. He was an early advocate for water meters so that people would pay according to how much they used and thus have an incentive to conserve. He also eyed the Owens River in California’s Eastern Sierra region. The problem of securing an adequate water supply for a relatively small population may seem quaint to us now that City of Los Angeles now numbers about 3.86 million people, but the growth rate of the City in the late 19th and early 20th Centuries was astounding. In 1890 the population was about 50,000. By 1900 it had more than doubled to about 102,000 and by 1910 it more than tripled to about 319,000 according to historical Census counts compiled by the California Department of Finance. Mullholland saw the trend and moved to act along with former L.A. Mayor (and Mulholland co-worker) Fred Eaton and J.B. Lippincott of the federal Reclamation Service. Eaton worked covertly on the City’s behalf to secure the options on the necessary land and in a key 1905 vote, the people of Los Angeles overwhelmingly approved $1.5 million in borrowing to get the Los Angeles Aqueduct started. In 1907 voters approved $23 million in additional bonds to complete the project. Adjusted for inflation, that $24.5 million in borrowing authority is equivalent to over half a billion 2013 dollars. Completed in 1913, the Los Angeles Aqueduct stretched 223 miles (359 km) to bring water and hydroelectric power to the burgeoning metropolis. There’s more to tell obviously, but that’s about where I am in the book. 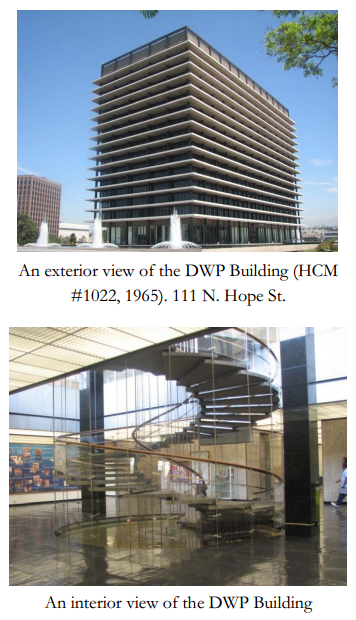 The Department of Water and Power (DWP) John Ferraro Building was declared Historic-Cultural Monument #1022 for its association with the growth of Los Angeles, its contribution to the Civic Center and its Corporate International style architecture. Source: OHR October 2012 Newsletter. So how does this story fit in with SurveyLA? One of our historic contexts is “Public and Private Institutional Development” and a theme under that context is “Municipal Water and Power.” This means that survey teams are on the lookout for property types like distributing and receiving stations, office and administrative buildings associated with water and power, power plants, reservoirs, dams, service yards and substations. The period of significance for this theme is 1916-1980, meaning that we expect that most existing properties that shed light on municipal water and power will be from this time period. SurveyLA doesn’t document things outside of the City of Los Angeles, so most of the LA Aqueduct would be out of bounds, but there are tons of places that reflect the history of water in the City. 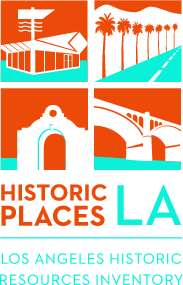 Why not head over to MyHistoricLA.org and tell us about your favorites? We’ll be glad you did!